India came to the third ODI with great confidence after winning the first two matches. Finally, India won the toss and asked Australia to bat first on a flat wicket. India went with unchanged XI for the third consecutive game. The former Indian captain MS Dhoni presented the army caps to all the Indian players and they played wearing the Indian army caps to honour the Pulwama victims. The Australian openers had a solid start. The visitors crossed 100 runs without losing a wicket and Usman Khawaja scored his maiden ODI century. Aaron Finch played really well but missed the well-deserved century by seven runs. Glenn Maxwell contributed with an aggressive cameo before he got run out because of Ravindra Jadeja and Dhoni's brilliance. Australia posted 313/5 in 50 overs. Indian openers failed yet again in this series. Ambati Rayudu's miserable series continued as he got out to a brilliant ball by Pat Cummins. India were 3/27 in the big chase. Dhoni and Virat Kohli bailed them out from the disaster start. Dhoni was bowled by Adam Zampa for 26. Kedar Jadhav then joined Kohli and they both had a very good partnership but it wasn't long as Jadhav got out for 26. 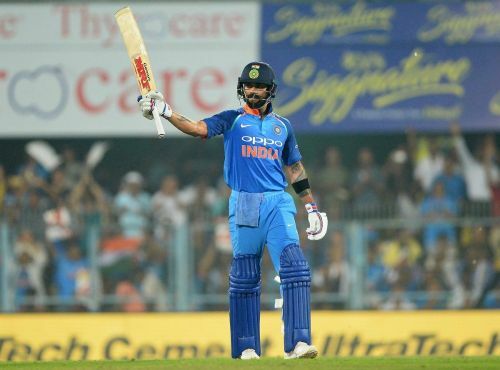 On the other end, Kohli scored his second successive ton of the series but he got out at a wrong time after scoring an exceptional 41st ODI century. When India lost Kohli's wicket, hopes of winning the game were minimal. Vijay Shankar and Jadeja chipped in with the cameo, but it was not enough as India lost the third ODI by 32 runs. Here is how the players and Twitter reacted to India's loss. Virat Kohli: We were looking forward to the chase, especially after we pulled things back. At one stage, we thought we would be chasing 350, but we pulled it back after Maxi's run out. We were optimistic, we were told there'll be dew at 7:30pm, but there's been none of that! So I got that wrong, I guess. The wicket wasn't improving, so you had to make the most of whatever loose ball you got. Tried to do that for a decent time, but you have to take the odd risk, and with every wicket lost, it gets more and more difficult. With three-down we had more chances, but at five-down, it was difficult. I got out, Vijay got out, and then there was no looking back. No team wants to lose early wickets, and we take pride in our cricket. We have strung partnerships after losing two wickets, but losing three in a bunch didn't happen. The guys who have got out, will try to make the most of the next opportunity. In terms of hitting the balls well, it was one of my finest innings, and even when we were three-down, I thought I had to play my game, the style that has gotten me to this level. But, I was disappointed getting out when the difference between balls and runs were only 20. Aaron Finch: It was a pretty good performance from our guys. To get over 300 on this wicket was a good performance. And to take three big wickets early was important. We know how hard it is for new batsmen to try and score quickly, so it was important for Usman and I to keep going. Allowed Maxi and Stoinis to bat freely at the back end. Personally, I've been training really hard, and I had faith that I'd get some runs. And it was nice to start us off with a nice opening partnership. Usman played a fantastic knock, Zampa bowled well, and Jhye Richardson was great. He put the pressure in the first 10 overs. Patty Cummins was at his best again. Usman Khawaja: There's nothing like winning, especially against a really good Indian side. But with Virat batting well, you can never count your chickens, but it was nice to get the win. The bowlers bowled beautifully, and we were going to probably bowl first too, but Finch batted beautifully at the start. And then Stoins and Carey finished the innings well. Once we had the total and we bowled well early, it was all about continuing. It was good to get my first ODI hundred, was out on 98 once before, so nice to get those two extra runs. Only the second time Virat scored an ODI hundred and India failed to chase down a 300+ target (other was also vs Australia at Canberra in 2015). I love watching @imVkohli bat & play cricket as he never ever gives up & always believes his team can win when he’s batting. Just a terrific attitude & one that warms my heart. Congrats to Oz on a wonderful win, some great signs with bat & ball ! Very happy for @AaronFinch5 too ! Ummm DRS. I’ve got no doubt Finchy’s LBW was out but I can’t see how on the earth that ball was hitting middle stump. Looked at best leg stump. Finch LBW. Are we just gonna ignore the fact that ball tracking had it pitching in a totally different place to reality? I saw it pitching middle, maybe even middle and off. Ball tracking had it pitching on leg. What if Virat Kohli isn't actually human? Only explanation for it.